Pictured, left to right, Superintendent Belinda Forman, Kala Switzer, Kaylee Grace Switzer, Eric Switzer, Jameson Switzer, and LCCE Principal Stacy Kidwell. 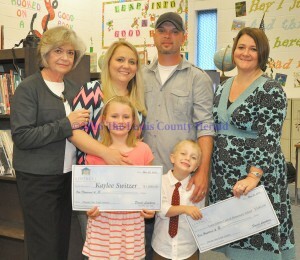 The family of a second-grade student at Lewis County Central Elementary has won a $1,000 college savings account after she shared her dream of becoming a teacher after college. Kaylee Grace Switzer submitted an essay for the “Dream Out Loud Challenge” offering how she would change the world after college by teaching children in impoverished areas who are currently without schools. The Dream Out Loud Challenge is sponsored by the Kentucky Education Savings Plan Trust (KESPT), Kentucky’s official 529 college savings plan. The Challenge invited students from pre-kindergarten through sixth grade to submit an original poem, drawing, video or essay answering the question, “How will I change the world after college?” Switzer, who attends Lewis County Central Elementary School in Vanceburg, submitted an essay describing her goal to attend college so she can build schools and teach underprivileged children.